The following is excerpted from the book "Joel Whitburn's Pop Memories 1890-1954" published by Record Research Inc., P.O. Box 200, Menomonee Falls, Wisconsin 53052-0200. This is a list of Cliff Edward's recordings as they would appear on the various record charts of the day. It represents what is known today as a Billboard chart. Note: Take this list for what is it worth as there was no scientifically accurate method to measure the chart positions in 1920s-1930s era. 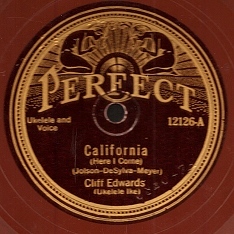 As you can see from the chart that Cliff Edwards would have had but two Number One hits.